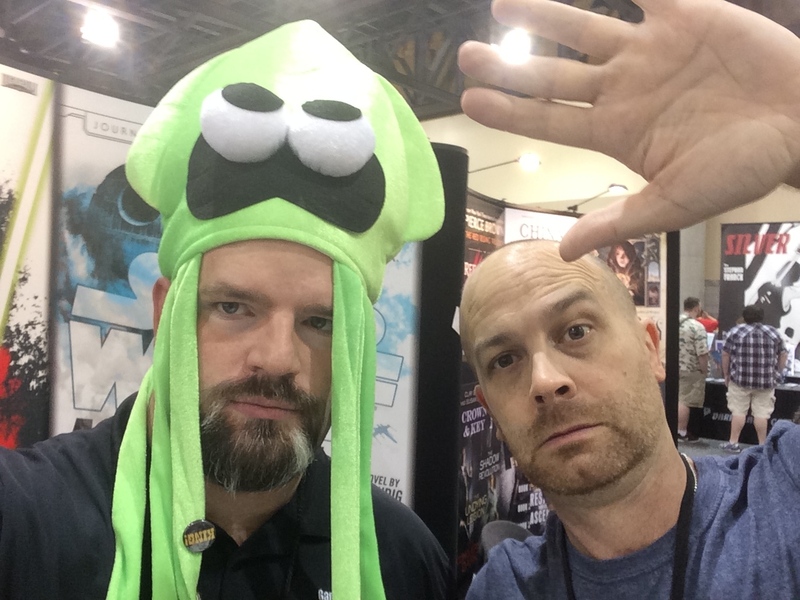 Yesterday, as you regular blog readers know, I took Anthony to his first convention. Erika was very nervous about unleashing the two of us on an unexpected metropolitan area. Apparently, I have a reputation in her eyes as a less than stellar driver. She must’ve forgotten that I spent my formidable school years in Pittsburgh, Pennsylvania, while definitely smaller than Phoenix, is still quite a bit larger than Prescott and the three or four neighboring towns. She instructed Anthony to text her at specific landmarks for the two-plus hour journey to deliver the one ring… Wait, no that’s something else entirely. Of course, Anthony and I arrived at the light rail station safely and somehow my limited skill set allowed us passage on the light rail and eventual ingress into the 2015 Phoenix Comicon. Now, I hadn’t been to a big con in probably like twenty years, but I’ve still had my fair share of small cons, trade shows and large Magic: the Gathering tournaments. Yes, I’m that kind of nerd. Grand Prix? Yep. Pro Tour? That too. I never made it to Worlds, but I’m a legend in my own mind. Anyway, PHXCC was massive. I’ve been to cons in Chicago and Pittsburgh, but they were smaller and more about the comic books, which was before they went all Hollywood. PHXCC had us crammed in like sardines, except it wasn’t fish oil that lubricated us, but the tears of failed dreams. Ya wanna know something? I relished every minute of it. Heh, you thought I was going to go all preachy on you. Poo-poo this or that, or try to pretend that I didn;’t totally geek out while I was there. Did you think that even after I totally stole that quote from The Big Bang Theory. Straight up, the image of the cast of BBT in their Star Trek uniforms is in my opinion, one of the greatest episodes ever. And since this is my blog, it’s the only opinion that’s allowed. Take that, BBT nerds! 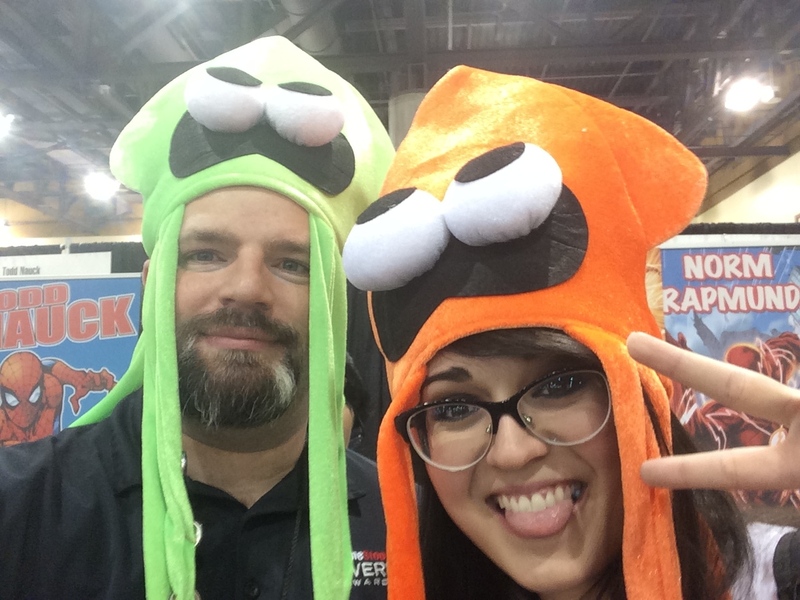 You already knew I wore my Splatoon hat, and I got more than a few thumbs up for my display of epic nerd culture. I had both of my Nintendo 3Ds with me so I could street pass the heck out of Puzzle Swap. I even had a plan to maximize my puzzle pieces by getting pieces on the lower half of the puzzles on one 3DS and the uppers on the other. What’s that you ask? Oh, yeah, one is a limited edition Animal Crossing 3DS XL protected in pink Nerf armor. The other is a plain black 3DS XL that replaced my Legend of Zelda 25th anniversary edition when I had to retire it. Although I’m full-on team Sony, I’ve owned every Nintendo console ever made. Special place in my heart and all that. Anyway, there were just too many street passes flinging around in the ether, and I think my final count for the five hours we were there was 150 or so. My brilliant puzzle scheme failed when I forgot which unit was doing what half of the puzzle. I may have had better luck if I let Anthony take charge of one of them, but damn it, they’re mine! Besides, he didn’t even wear a costume or a funny hat or anything. 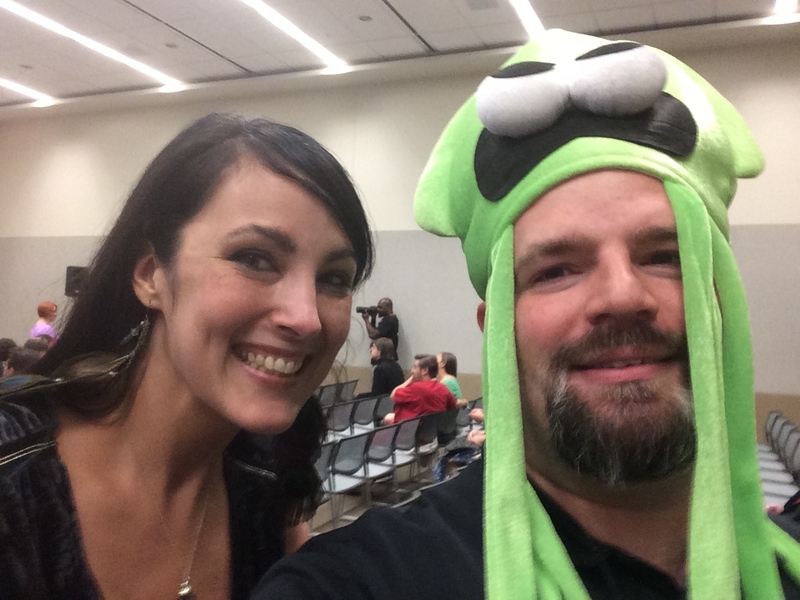 He labored under the false belief that he might look out of place dressed up in a Creeper costume, or my Luigi hat. On the way back up I-17, he looked to me with wonder in his eyes and declared that he would have the most epic costume next year. 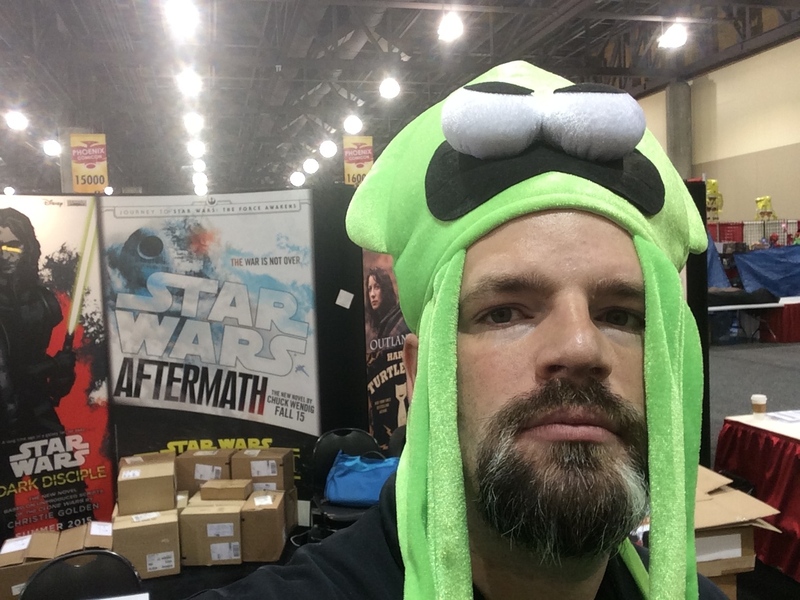 My goal for PHXCC was to get as many pink puzzle pieces I could; snag an Star Wars: Aftermath poster with Chuck Wendig’s scribble on it; get an autographed copy of Hit, by Delilah S. Dawson; an interview with one of several authors I follow on Twitter; to fill up all the tentacles of my Splatoon hat with free con swag pins; and to not spend more than the $200 I’d saved up all year in book royalties. I was successful in all goals, but the pins. I’m sad… I like me some pins. I’m sure there’s a photo on this blog somewhere of all the Disney pins I’ve collected when we could afford to do Disneyland twice a year. I mean, seriously, vendors? We want to adorn our bodies (well costumes) with shiny trinkets advertising your product. MORE PINS IN 2016! 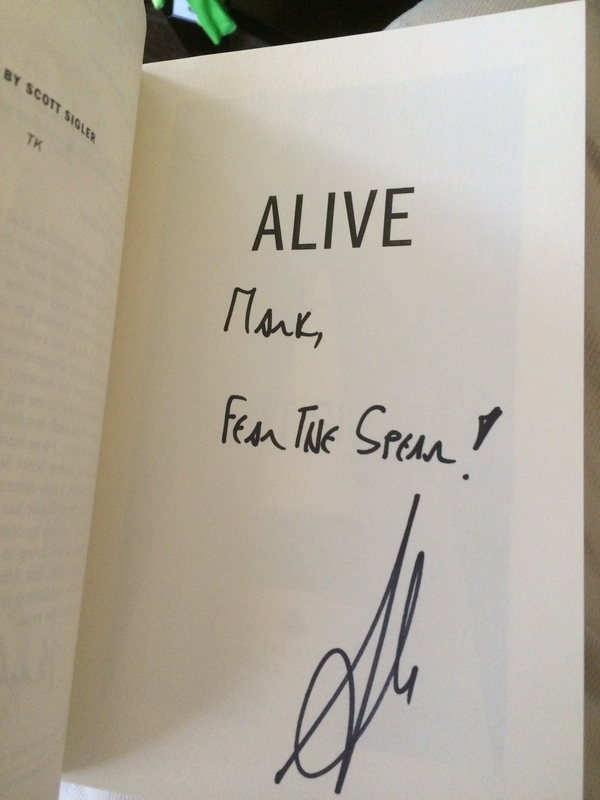 I did manage to pick up a signed ARC of Alive, by Scott Sigler, which was hella cool because I’ve got the Alive eARC from Net Galley to read before the book comes out. I missed out on getting a signed ARC of Zeroes, by Chuck Wendig. I should’ve gotten one, but I totally brain farted and didn’t get to the spotlight held by Del Rey. I mean, it would’ve only delayed our egress by maybe twenty minutes. Oh well, I’m gonna get the ebook anyway because I’m a Wendig fan boi. 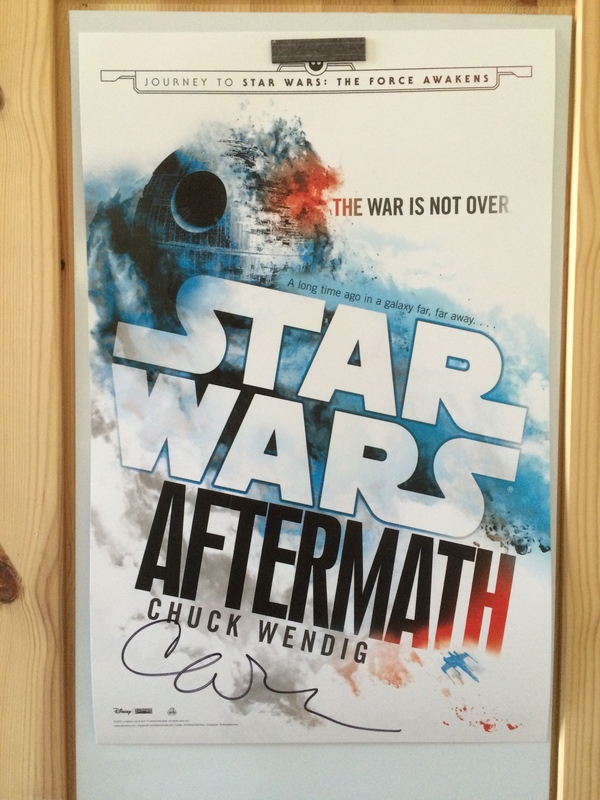 Chuck seemed mortified that I’m not a Star Wars fan, and the only reason I want Aftermath is because I like his writing. They’re cool movies and all, but I’m more likely to argue Trek canon for hours if someone were inclined. I really don’t care what happens in a galaxy far, far away… Oh, and in case you’re wondering, TOS was a great series, but I’m on team TNG, with VOY being my favorite series. I saw the fan-funded Star Trek thing was premiering during the con, but alas, TOS was my least favorite series. Yes, I liked ENT with its lame story arcs and early demise. Although, to be perfectly honest, I’ll watch pretty much anything with Count Bakula in it. For those of you whose eyes glazed over at the acronyms, don’t worry, it’s Star Trek stuff, and apparently wasn’t meant for you. For those of you who also follow my Twitter feed, I’m sorry, lo siento. 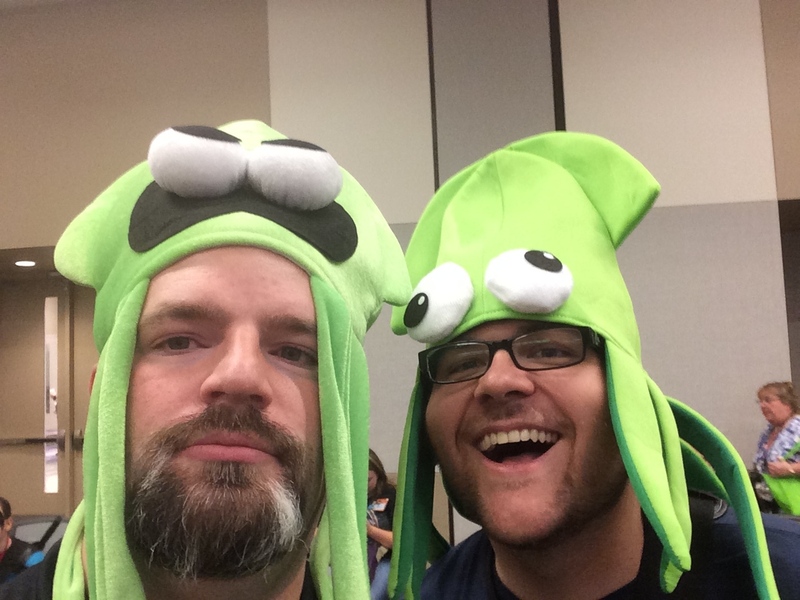 But you were privy to all the author selfies I took with my epic Splatoon hat. Despite that upstart Sam Sykes harshing my Splatoon mellow, it was tres totes magotes. I did manage to score five minutes with Delilah S. Dawson for an interview after the MOTHER TRUCKIN MONSTERS panel. (I had written that panel title properly and then had to go back and change it to all caps. Seemed apropos.) Delilah was awesome, funny, and put up with both my seemingly poor mastery of technology and Anthony sighing heavily in the background. She has kids too, so we made fun of him as only parents of angsty children can. It’s a club, and you’re not invited. 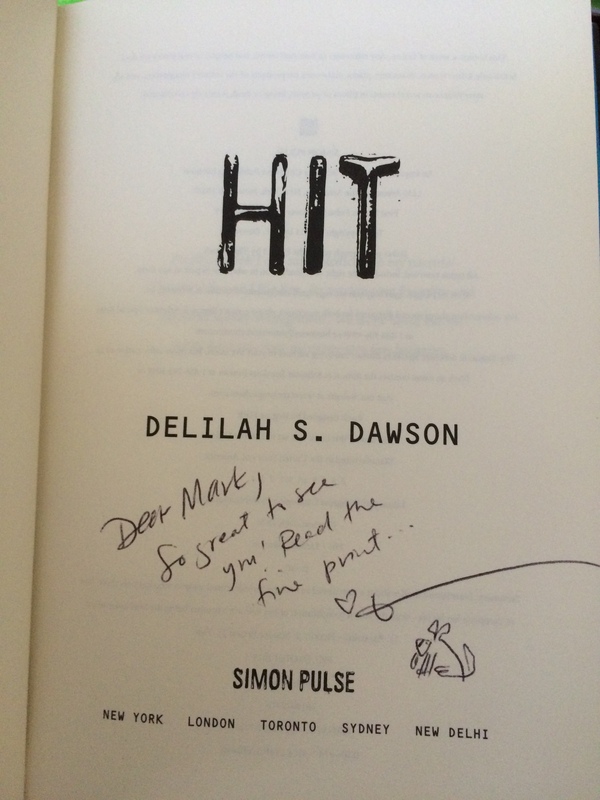 Her interview will bee next week following my review of Hit, which I’m totally groovin’ on right now. Anthony and I will be at PHXCC2016, what about you? 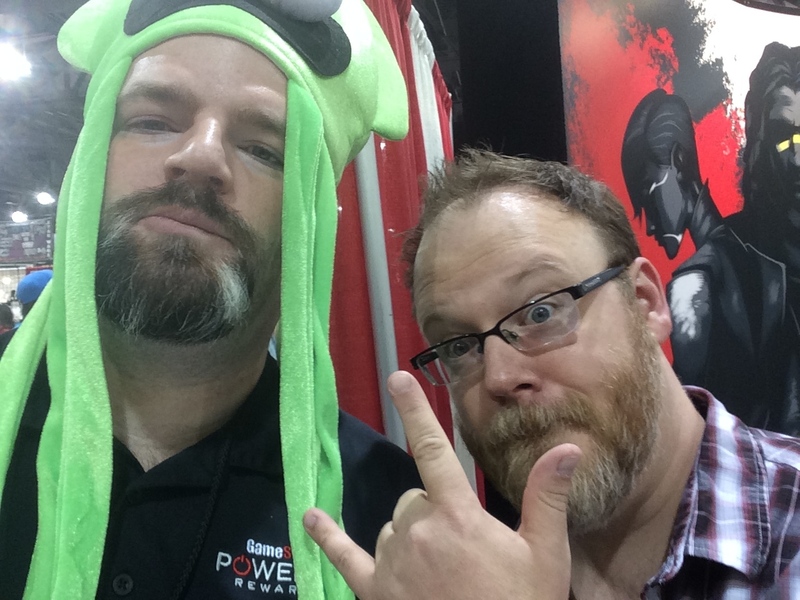 This entry was posted on Sunday, May 31st, 2015 at 17:30	and tagged with phxcc and posted in Uncategorized. You can follow any responses to this entry through the RSS 2.0 feed.